KGUN 9 reporter Brian Brennan interviews JTED @ Star Construction instructor Craig Bal and students Luis Villa and Lorenzo Nourjian about the value of Career and Technical Education. Construction students at Cienega High School restore a 1915 home, the first class of Community Service Officers we graduated with Tucson Police hit the streets, and check out Construction and Career Days all in the December edition of The Way to Work! Green Valley News reporter Kim Smith reports on how Pima JTED’s Construction and Heavy Equipment Operations students are highly sought after by employers who are facing a shortage of skilled workers. KGUN 9 reporter/anchor Kevin Boughton caught up with students at our JTED @ Star – Storm Center who will develop innovative new products and try to impress the sharks with them on June 29 to win $5,000 in scholarships. KGUN 9 Reporter Craig Smith reports on ways students can avoid being replaced as employees with robots by focusing on the right high-demand jobs for the future. The story airs tonight (May 15) at 6 p.m. on KGUN 9 News. Our Veterinary Science students invite you to bring your best buddy to the JTED @ Amphi Land Lab clinic this Saturday, May 12, from 8 to noon, for free vaccines and microchips. Our Culinary Arts champions are headed to Nationals, Caterpillar treated our students to a Day in the Dirt, UA Physiology students are helping JTED students make a successful transition to the UA, the JTED Foundation is offering lots of scholarships, and much more! Use your phone to make a 2-5 minute video about your favorite CTE/JTED program and you could win one of 23 $1,500 scholarships generously offered through the JTED Fund by Mr. Ross Potoff. Arizona Daily Star reporter Shaq Davis reports on a trio of Law, Public Safety & Security students who are working to keep elementary students safe. KVOA TV 4 reporter Eric Fink reports on our EMT students who help provide first aid at local events such as the Cologuard Classic golf tournament. Dozens of JTED students are celebrated as they sign letters of intent to attend Pima Community College on National CTE Signing Day, and Tanque Verde High School student Cassidy Camp keeps busy on her dream of becoming a general contractor by taking three JTED programs during her senior year. KGUN 9 reports on how the Pima County Youth Career Connect project, Southern Arizona Manufacturing Partners, and Pima County One-Stop worked with us to arrange a trip for 140 Sunnyside students to tour 10 local manufacturers to keep students and high-paying jobs in our community. Tucson’s top photographers help our students develop their skills, Law & Public Safety students become Young Protectors to keep kids safe, and a generous gift from the Arizona Cardinals may save lives, and more in the January edition of The Way to Work. Our Heavy Equipment Operations program grand opening in Sahuarita gives business and community partners a reason to cheer, our Star Construction students return from helping the Lone Star State, and we salute our “Outstanding” NJROTC program at Cienega High School in the November edition of The Way to Work! Construction companies build opportunities for students at the Southern Arizona Construction and Careers Days, The Rotary Club of Tucson deserves a “Classic” thank you, and more in the October issue of The Way to Work. Southern Arizona Construction and Career Days are designed to demonstrate a wide variety of high-paying, in-demand jobs in the construction trades to high school students. KGUN 9’s Craig Smith reports on the two-day event that hosted 1,500 students. Ten JTED @ Star Construction students give up fall break to volunteer to rebuild homes in Houston, our Alumni Spotlight catches Corrections Officer Daniel Conrad and Tucson Federal Credit Union gives generously to help JTED students, plus more in our September edition. Our Governing Board tapped Sunnyside CTE Director Kathy Prather to be JTED’s new Deputy Superintendent, the Connie Hillman Family Foundation’s recent gift match comes just in time for the JTED Fund’s Gala Celebration, our new Physical Therapy Techs are moving into jobs easily, plus more news in this month’s edition. Notice: Formal adoption of textbooks for Nursing Assistant and Medical Assistant are being considered and will take place after the textbooks have been reviewed by the public for a period of sixty days (prior to the ratification for a formal adoption). Our Veterinary Science students describe their experiences working with professionals at the Pima Animal Care Center, and our Law students are landing jobs and giving back to the community. View award-winning photography, and more in the April edition of The Way to Work. 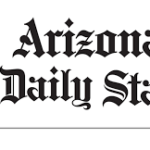 The Arizona Daily Star’s Angela Pittenger reports on our Palo Verde High School CTE/JTED Robotics team winning awards, scholarships, and an invitation to participate in a worldwide competition.